We decided to take last week off and ride. 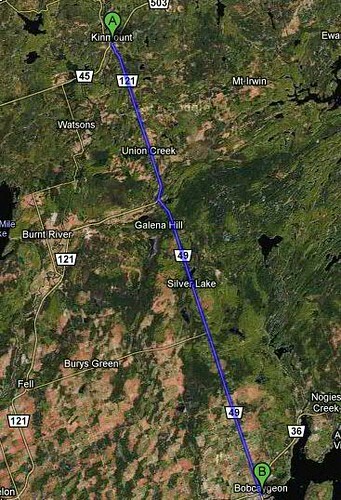 The original plan was to go to Virginia (where we rode in 2009) but we changed our minds in favour of the cottage in the Haliburton Highlands. Here is the account, day-by-day. There is still snow in the deep woods; the frost has not worked its way out of the cottage road. We cannot drive the car into the cottage, so we parked it just off the highway and put the bikes in the car. The walk in (and out) is about 40 minutes. We left the cottage at 1:00 in the afternoon (it was raining in the morning) and didn’t return until 7:30 pm. We rode north to Minden, and then up an 8 km climb to Gelert which is hardly a spot on the map. Norm, who runs a meat store in Gelert, didn’t have smoked trout – trout season doesn’t start until May 24. Opportunities are thin here – the soil yields nothing, and traffic mostly passes through. The walk back in to the cottage was magical – at this time of year the buds are tight, and the sun illuminates deep into stands of hardwood that, in three weeks, will be a solid curtain of leaf. 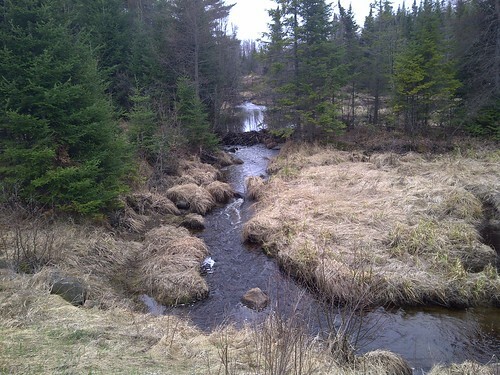 Where the road dips down at the beaver pond the chorus of frogs was almost deafening. There’s no question what’s on their mind. A morning start. Deer and moose had left their unhurried tracks on the road where they stepped through the thawed patches. 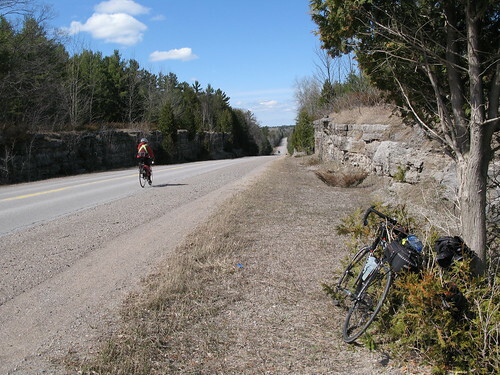 We rode out and back to Bobcaygeon on a straight road that rises out of the igneous shield and speeds straight-lined in the direction of Lake Ontario. This is one of the north-south roads built in the late 1800's to move populations into the hinterland. These roads turn course only when a lake or river dictates its superior will. Bobcaygeon is a pleasant village that thrives on the traffic of 32,000 boats going through its locks every summer. Mary found a pair of lined leather gloves there – her hands have always been susceptible to cold. 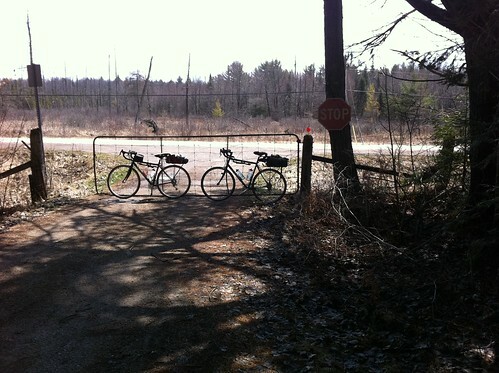 Our rides so far aren’t long – we’re shaking loose our bones after a winter’s hibernation. Yesterday was 57 km, today was 67km. We climbed about 450 m both days, and our average speed was just over 17 kph. Winter training – either spinning or on the CompuTrainer – is not the same as the big, bad world. Pavement riding is different. We have a long way to go before we’re road ready. Tomorrow the weather turns. The night will be cold (minus 4), but the morning should be sunny. By afternoon showers will blow in, and then the rain will come. We will ride west first thing in the cold morning. Our plan is a short ride – 37 km return, but our objective is to do it non-stop. The afternoon could bring rain. It’s no fun getting caught in a frigid, cold rain a thousand miles from home. We still have a whole summer to get in shape. The ride today to Norland on highway 503 was non-stop return . 503 part of the old Monck Road, which meanders east-west. It was built in colonial times to encourage traffic between settler communities, with very limited effect. The villages in the shield were always poor at one point or another in their history. Kinmount, the village closest to us, was at first a logging town, then mining, then railway, then something else. It has prospered in the past 10 years due to a concerted effort by the villagers to attract a doctor. 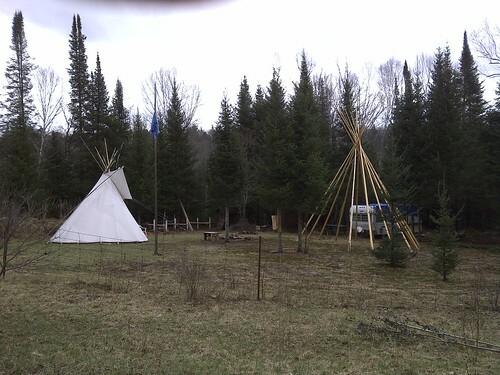 They offered a building, administrative staff, and anything else a doctor might want to establish a practice in "northern" Ontario (Garry take note). The results have been noticeable. People come from a radius of 100 km to see the local doctor. Success breeds success. There is now a chiropractor, a pharmacy, and a farmer's market. The village has gone upscale with street curbs and hanging flower baskets in summer. It is interesting to view health services as an economic stimulus rather than a social burden. I have to mention the local farmer and his wife. Their farm is about 800 meters up the road past our parking spot. She sells eggs; he operates the World's Smallest Bookshop (think 8 feet square). Both are open 24 hours a day, 7 days a week. The eggs are farm fresh; the books (all hardcover) are properly catalogued and arranged (history, politics, fiction, etc.). It is a three dollar flat fee for anything in the store, paid on an honour system. It is fabulous. 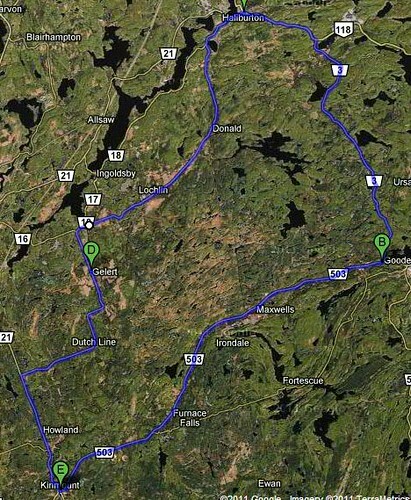 In any case, today’s ride was successful, and on Wednesday we plan to do the loop to Haliburton. 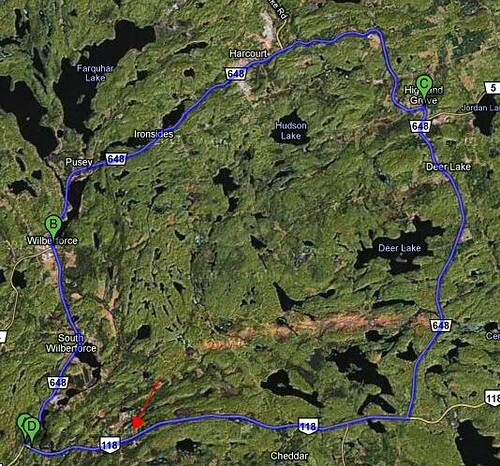 We are building towards a loop that goes Kinmout – Gooderham – Flynns Turn – Bobcaygeon – Kinmount; something about 110 km. This building of momentum is usually what happens on our tours, so it is no surprise that we need to build strength. Our first rain day. We have decided the roads around here are very good for cycling. Some roads have a small, paved shoulder of about two feet, and the winter's sand is sometimes still on the shoulder, but by in large the roads are good and drivers have been courteous. "Where is the rain?" Mary asked at 3:30 this morning. The sky was a blanket of stars from one horizon to the other. The question was answered an hour and a half later. We heard the arrival of the storm. Since then it has rained on and off, mostly off. We need a rest day, at least Mary does, so the rain is a good excuse to get some chainsaw chores done around the cottage. A massive moose walked into our driveway sometime around 10:30 this morning, unseen by either of us, but his hoofprints left no doubt as to his size – I had to spread my fingers to cover his print. The rain has also filled the rain barrels. This is good. Since someone stole our river pump five years ago we have relied on rain for our water supply. We rode in bare legs for the first time this season; one hour into the ride we were down to bare arms! There will summer, after all. 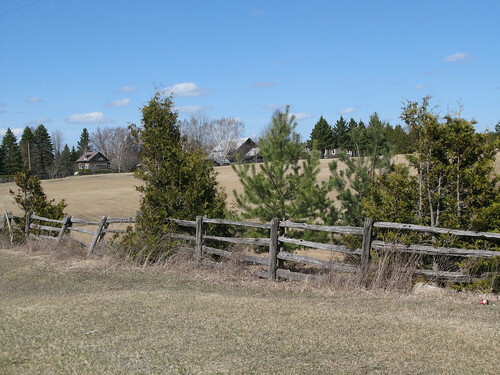 Glamorgan Road (Haliburton County Road 3) is a beautiful stretch of paved back road that climbs in long series of rolling hills through the highlands. 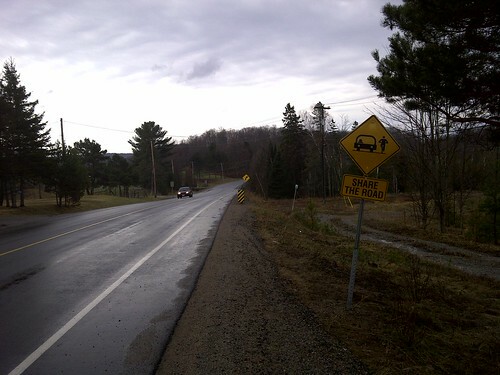 After climbing for 20 km there is a nice downward swoop that carries you to highway just outside Haliburton. We passed two massive beaver dams that I did not get a photo of. Beavers are Canada's national symbol. These buck-toothed rodents are notorious workers. They are endearing and cute until their dams cause flooding. Humans use anything to dismantle the dams – shovels, backhoes, dynamite, you name it – and the dams will be rebuilt within 24 hours. Luck paid us a visit as we locked our bikes to the railing outside a restaurant in Haliburton. The forecast rain blew in, and we listened to the sound of thunder while sipping our soup. By the time our second espressos were finished the rain had blown through and we were back on the road for the return. 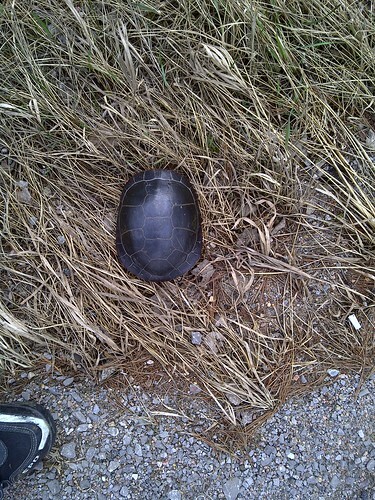 I rescued a painted turtle that had got itself stranded crossing the highway. It retreated into its shell and would not come out for a portrait – ingratitude! Mary had plotted today’s course on Google Maps using the Bicycle option. It is interesting to see which roads Google chooses. 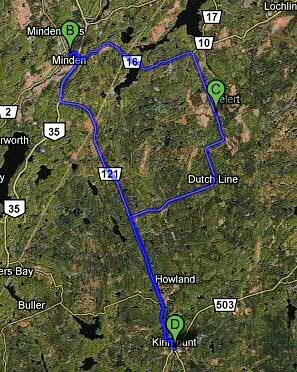 There are a few suggested sideroads that I would want to drive before committing myself in the saddle. Our luck with the weather held all the way back. It was only when putting the bikes back in the car that the rain returned with a vengeance. 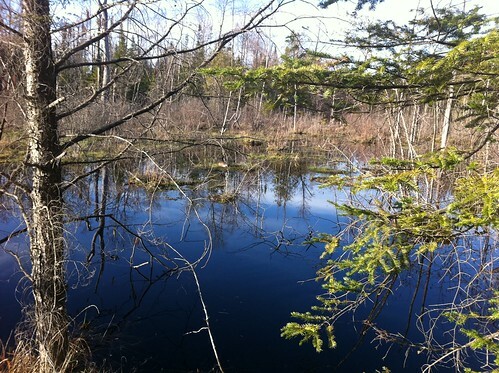 The frogs at the beaver pond had a field day; their song was so loud it almost hurt the ears. We were soaked to the skin by the time we were back at the cottage. Our second rain day. Enough. The barrels are filled. 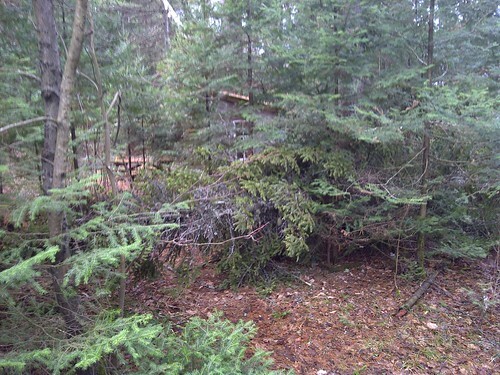 "The good news is that we still have an outhouse." The bad news was that we had to cut our way into it. Yesterday brought vicious winds that ripped out trees and twisted limbs like matchsticks. Hydro and phone utility crews are out in force today restoring services for tens of thousands. It was late morning when Mary came out to suggest I leave my chainsaw and we ride. We decided to do the Wilberforce Loop. We have driven past The Loop countless times but have never explored it. So we put the bikes on the car rack and drove to Tory Hill, stopping at Gooderham en route. That stop was a mistake. We each had a bag of potato chips, a.k.a. crisps (Bad, Bad, Bad!). The tiny glimmer of sunshine we saw in the morning pulled a disappearing act as soon as we started riding – it was north winds and scattered showers all the way, with a temperature of about 7 degrees. "Dismal" was Mary's description. The countryside would have been charming in sunlight; under a leaden sky it all just looked gray and hard as stone. The few villages on The Loop (highway 648) have a hardscrabble air to them. I was just taking a photo of the Lonely Road (other direction) when I caught a glimpse of Titanium Man in the distance. At that I could not contain myself. I took off in a burst of bravado and left Mary to her own devices. In the last 5 kms I went all out, and I swear he was just turning the corner when I got to the car. It was an exhilarating ride. The "Lonely Road". Note Titanium Man. No stats. The battery went on my bicycle computer (again). What a pain. It's a good thing the stats don't matter. At the beaver pond a goose was nesting in the grasses. She may have been one of the pair who honked overhead on the way out this morning. The snow has disappeared except for the deepest woods, and blankets of green shoots have pushed past the leaves on the forest floor. Buds are almost bursting, and tree tips are blushing red in new bark. Tomorrow is the big ride. Tonight I can see my breath. It has been an excellent day. How excellent? Well, I am on my second martini and it has five olives. The day started cool, cloudless and bright. The shadows of the trees were like pencils across the road walking out to the car. 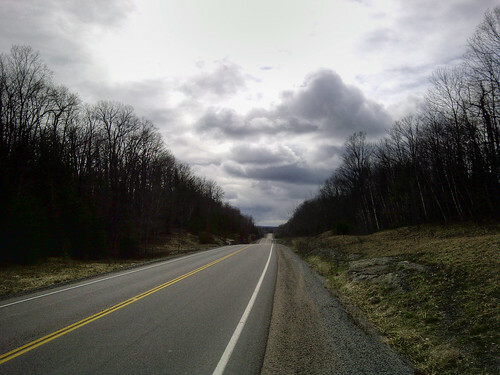 The ride to Gooderham was well paced (highway 503), climbing through the rolling hills. 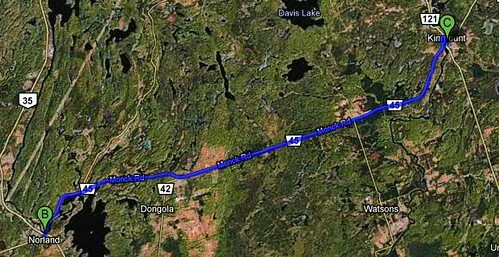 This stretch of road, about 27 kms from Kinmount, has a great paved shoulder its entire length. It turns and climbs all the way. We have decided it is a great ride. At Gooderham we turned off onto highway 507, a road we have never seen before. Its asphalt is weathered, old, and crumbling in spots. The road is a twisting, turning, ragged scratch across the Canadian Shield. It is a favourite of motorcyclists who like to time trial themselves and post videos on YouTube. At least one gets killed each year. Forty-five kilometers into the ride we sat on a rock ledge and ate egg-and-arugula sandwiches for lunch. 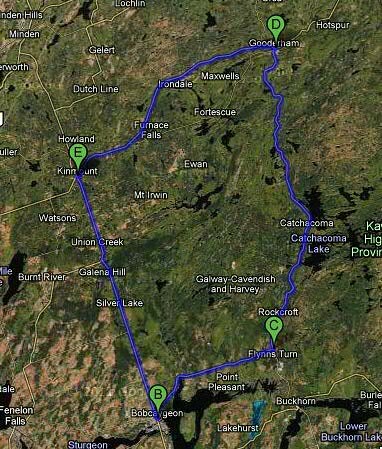 The road from Flynns Turn into Bobcaygeon was almost painful. On the first nice, sunny Saturday of spring motorists were impatient to finish their afternoon chores. There was no shoulder, traffic was fast and lots of cars were too close. It is a road best avoided. In Bobcaygeon we borrowed a pen, signed our tax forms, and filed our annual tax returns. There. The country now stays solvent for another year. The sun was low by the time we rolled through Kinmount on the way to the cottage. 110 kilometers distance. 18.1 kph average speed. 800 meters of climbing. The goose was still at the beaver pond. We may have a new neighbour. 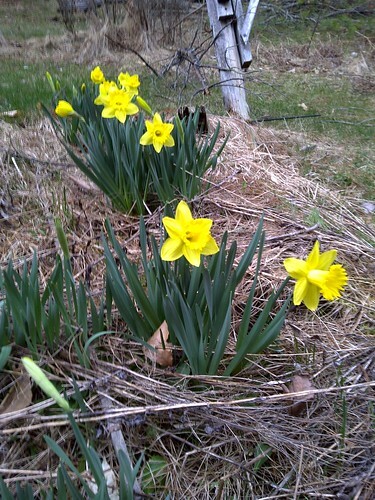 At the cottage the daffodils had opened. Spring has arrived finally. It has been a very good week. Posted by Kern on May 7th, 2011. Fantastic report, very evocative, I can really feel the relief that spring is banishing the deep Canadian winter. It's like a different world to my little corner of England. Well, it is a different world. Wonderful. It puts our own so-called natural environment into perspective. Even our Scottish Highlands are a blip in comparison. I suppose you'd have to fly over this region to appreciate the sheer vastness. Is this the boreal forest? What also comes over is how you must look after yourself, miles from anywhere or anyone, subject only to the forces of nature in a true wilderness. Kern, I now see the significance of your previous references to chainsaws, helmets, and cycling in the big, bad world. Yes, superb post Kern. As Alan says it really is a different world out there, you certainly need to be self reliant. The concept of such vast areas of forest is hard to grasp living on a tiny island where the scenery changes every 5 miles or so! A mix of awe inspiring and scary I think. Great stuff! Thanks folks. It's really not as rugged as all that, it just sounds good. There is actually civilization scattered across the region, but it is sparse in spots. We have not previously spent time at the cottage at this time of year and it was very special to witness the unfolding spring. It could become a habit. Patrick asked: Is this the boreal forest? No, it is not. 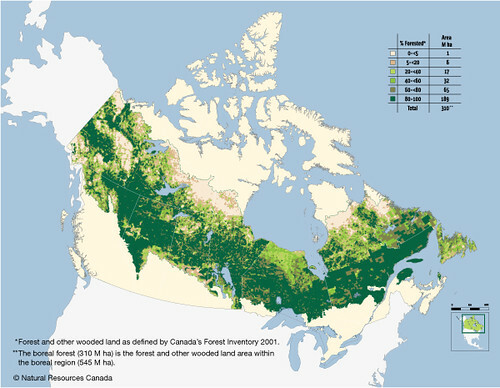 The Boreal forest is quite a bit north of us. 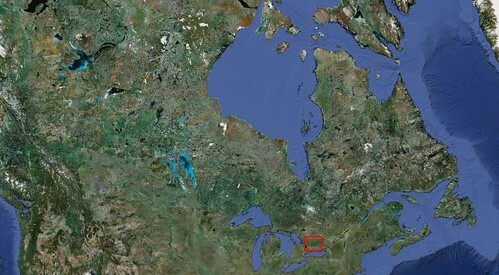 We're in the white area below which goes by the exotic name "Eastern Mixed Forest".